West Midlands UKIP MEP James Carver says he is poised to become a “key guardian” of Britain’s Brexit strategy, once Article 50 is triggered tomorrow. He and 19 colleagues in the European Parliament – which also must give its consent to the divorce terms – have reaffirmed their commitment to keep up the pressure to prevent any watering down and backsliding during the lengthy negotiations. Mr Carver said his party’s “six key tests” would be closely monitored and challenged throughout the process. UKIP leader Paul Nuttall has vowed they will be “Brexit guard dogs” throughout the Prime Minister’s negotiations with Brussels. Their six-point plan covers what UKIP believe to be critical - legal, migration, maritime, trade, money and a time test. Mr Carver, UKIP’s Foreign and Commonwealth Affairs spokesman, said: “We must retake our seat on the World Trade Organisation, take full control of immigration and asylum polices, restore our fishing industry and re-establish our fishing waters. “Having led the country to the momentous decision to free ourselves from the shackles of the European Union, we embrace the period of exit talks. “We must also demand that Britain sweeps aside thousands of needless EU regulations after Brexit, which cost us more than £120 billion per year. “The Common Agricultural Policy alone is said to cost £10 billion in direct costs and by inflating food prices,” added Mr Carver. The champagne corks will be popping at his Kidderminster office tomorrow as he celebrates the triggering of Article 50 with fellow party activists. 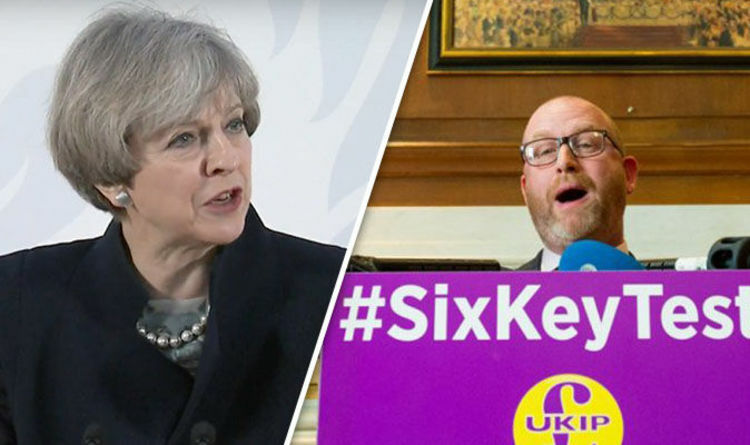 PAUL NUTTALL has issued Theresa May with a stern set of challenges to ensure she delivers a successful Brexit for Great Britain.